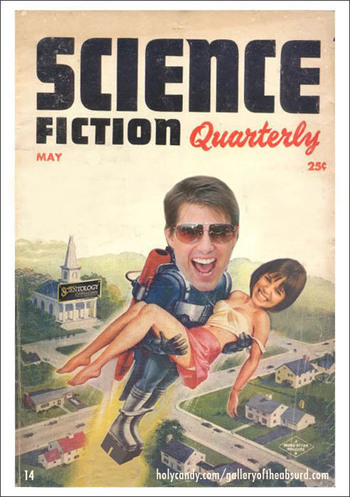 Tom Cruise and Scientology are at the center of a publicity nightmare this week after Gawker posted a leaked Scientologist video that made the infamous Oprah couch-jumping video look sane. The video is so oddly disturbing that it's made the news around the world. On top of that, he's angry as a hornet about an upcoming unauthorized biography promising shocking Scientology claims and secret details about his bizarre life. And it certainly can't help matters when Tom is accused of "battling middle-aged spread in recent years and looked 'distinctly jowly" on the red carpet last week." Katie Holmes hasn't escaped controversy either. 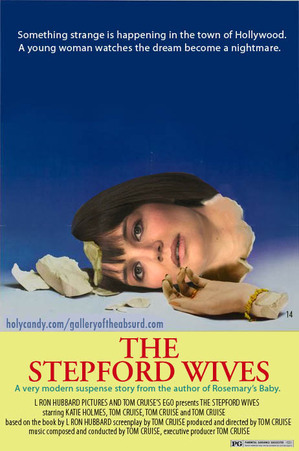 Much speculation has been swirling regarding the possibility that Tom Cruise might have transformed an unsuspecting Katie into his own personal Stepford Wife. Poor dear has gone through a dramatic metamorphosis since marrying Tom. Medium: Digital composite, Katie photo from Getty Images via A Socialite's Life. Much thanks to Kimberly and Circus Hour Media. 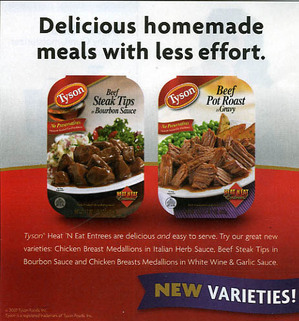 how much dog food and people food seem to resemble each other these days? 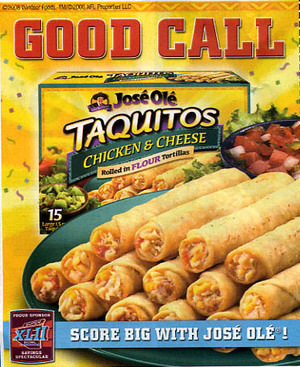 Sitting in my local coffee shop, I began flipping through the savings coupon section of the Sunday newspaper. 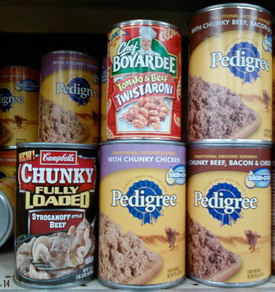 I noticed several coupons for dog food and dog treats mixed in with the typical junk food offerings for humans: Hungry Man, Toaster Strudels, Lunchables, and Campbell's Chunky Soup....shudder. Really, it all becomes a blur if you start taking notice of it. 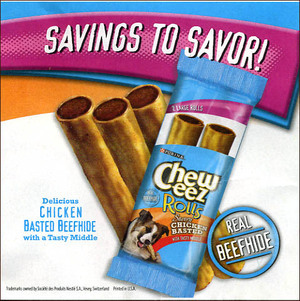 I bet you could give the cashier a coupon for Cesar Canine Cuisine and they'd take 50 cents off your Van De Kamp's Fish Sticks without even batting an eye. 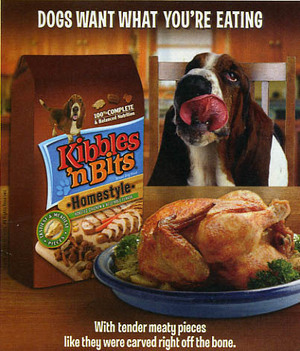 Observe how disconcerting these ads become when a dog is added to the image. I think the point has been made. 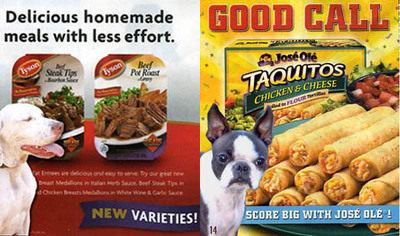 Medium: Scanned Sunday coupons, doggy models General Otis and Abigail Bunny Rocket. A glossy new celebrity tabloid is scheduled to hit the stands this spring – because the world doesn’t have nearly enough of them – and the editors were kind enough to send a few preview issues for exclusive promotion on Gallery of the Absurd and Candy Kirby. Celebrity Drugs & Alcohol Weekly explores the saturated world of celebrity substance abuse and other fun topics! The rag is projected to outsell both Star and US Weekly combined, just based on the amount of stories celebrities generate for the magazine each week. Regular features will include “Mug Shot Makeovers,” “Jailbirds: Just Like Us!,” “DUI Fashion Police” and “Who Snorted It Best?” as well as interviews with Jack Daniels fans such as Tara Reid, Vince Vaughn, Amy Winehouse and Mel Gibson. Best of all, Courtney Love has agreed to write a weekly unsolicited advice column called "Ask Courtney". This, I believe, is the best feature in the magazine (see below). Keep an eye on newsstands because you won’t want to miss the premier issue of Celebrity Drugs & Alcohol Weekly featuring a bevy of blonde boozehounds, as you can see above. Celebrity substance abuse: it’s never been hotter! Medium: photo composite, digital text, graphics created by 14 in collaboration with Holy Candy. Courtney's advice and post written by Candy Kirby. Much thanks to Holly.